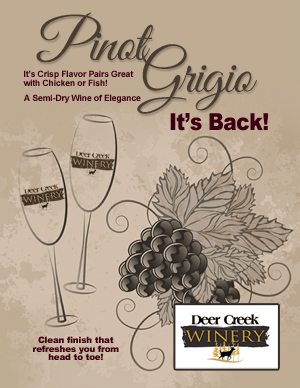 We are happy to announce the re-release of our Pinot Grigio wine! This crisp, white wine is made from the grayish-blue Pinot Grigio grape and is of the same Pinot family of wines that is making its popularity known world-wide. In the U.S. you may see Pinot Grigio and Pinot Gris on the same label. In Italy is it always called Pinot Gris, but here in the US it can be either. This wine has a very distinct grape aroma and flavor with a brilliant color. Even as a dry wine, it carries a sweet undertone. Its refreshing taste makes it the perfect wine to pair with most any chicken, fish or light entree dish. It will please even the dryer wine of connoisseurs. It is often used in cooking for its distinct flavor and richness that other wines just can’t compare. Pinot Grigio grapes have been around since the middle ages and is a very close cousin the Pinot Noir grape. Pinot means “Pine Cone” in french which comes from the clusters of grapes that resemble a pine cone in their shape. The word “gris” meaning gray in French. If you have not taste tested our newly re-released Pinot Grigio, you need to give it a try! This wine is very popular and you would not want to miss a great bottling of a terrific wine. 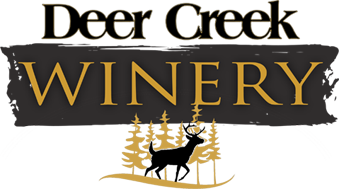 Stop into any Deer Creek Winery location and ask for Pinot Grigio.